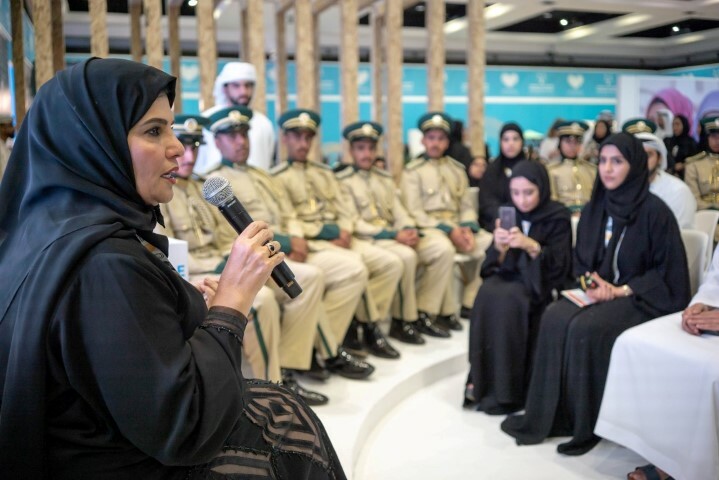 SHARJAH, 26th October, 2018 (WAM) -- The second and final day of the Investing in the Future, IIFMENA, Conference hosted a group of young representatives of international organisations, human rights activists and social activists in three sessions that discussed the role of the youth in combating climate change issues, offering a platform for strengthening youth participation in the Middle East and North Africa’s, MENA’s, development. It also heard from inspiring voices who are building pioneering models of future development and growth. Organised by The Big Heart Foundation, TBHF, in collaboration with several UN agencies and NAMA Women Advancement Establishment, NAMA, under the theme "Youth - Crisis Challenges and Development Opportunities," the two-day conference has played a key role in gathering young representatives of youth refugee groups, minorities, decision-makers, government and international officials and has offered them a platform on which they can exchange insights and reach innovative and more youth-sensitive solutions to help overcome pressing challenges being faced by the future generations of MENA. The session titled, "Youth and Climate Change," featured Barney Swan, international director of Climate Force, and young Emirati environmental activist Ameera Al Marzooqi, who drew from their personal experiences and activities in the field to encourage youth participation in averting the detrimental effects of environmental degradation by sensitising them to their responsibilities towards their communities and the world at large. The second session focused on inspiring, influencing and empowering the youth. The stage was taken by an all-girl student team from Pakistan who successfully built a single-seat racecar. The 10-member team from the National University of Science and Technology Islamabad built the formula car for the Student Formula Competition, competing with student teams from across the globe. The team, called "AUJ," built the car without any mechanical engineers in their ensemble. The members came from different disciplines, including electrical engineers, industrial designers and business managers. Wardah Jamal, a student member of the team, said the greatest challenge was being an all-girl team in a male-dominated industry where motorsports are practically non-existent. Despite overcoming hurdles such as a lack of funds, logistics or prior experience, they remained undeterred. Adding to Jamal’s comments, a second member of the team, Azka Athar stated, "Another challenge we faced was the gap between our theoretical knowledge and common terms in the industry when we went to make purchases of car parts from local vendors in Pakistan. We also had issues with paperwork and shipping the car finally to the UK for the competition." Sabah Zaman, the driver of the AUJ Rally, noted that to her, the joy of driving a car they had made with their own hands was inexpressible. Their invention won the RACE TECH Spirit of FS Award - Formula Student 2018. A third session titled, "Youth-led Discussion: Youth Participation in MENA Development," organised in partnership with SOS Children’s Villages, saw representatives from the Youth Advisory Council, United World Colleges, United Lebanon Youth Project, and UN Youth Assembly share the results of their recent four-day counsel session, where they discussed the measures needed by the youth in the MENA region to affect change. Moderating the session was Managing Director of SOS Children’s Villages International, Gulf Area Office, Jumana Abu-Hannoud, who started the discussion by asking the panel to identify the greatest challenges facing the youth in the MENA region today. The consensus was education. Youth across the MENA region were concerned about what subjects they should choose to study at university, whether they had made the right subject choice, and whether their education would help them in their careers. While it was recognised that the youth have a collective strength in the region, there was a lack of direction and faith that they could be agents of change. The panel identified a solution in creating one common platform for all Arab youth, where opportunities can be shared, solutions sought, and action plans executed. The need for NGOs to lend support to the youth in the MENA region was another key talking point, with the panel calling for more opportunities for their ideas to be heard in the professional arena. The session closed with the panel reiterating the shared energy of the group, vowing to move forward and make the necessary changes to give the youth in the region a voice. "It’s time for the youth to develop a sense of responsibility. It’s time for the youth in the MENA region to stop saying ‘I’ and start saying ‘We,’" the youth representatives concluded.